I did promise to make a proper post for my Plush You!-duo, so here you are, Catherine the rag-cat and Bearnard the rag-bear, my party animal Rag Pets! 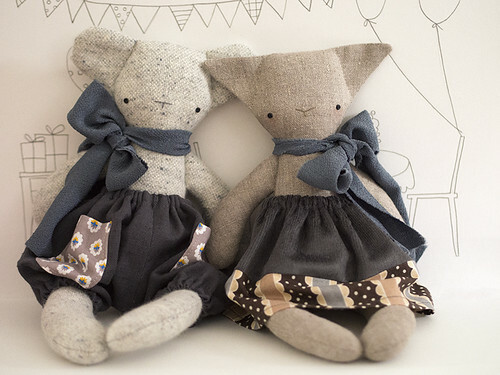 I wanted to do something simple and monochrome-ish, and since I was a little bit short on time (and on some of the fabrics I wanted to use too), I made this duo in a smaller size; both Catherine and Bearnard stand at about 32 cm tall, or short as the case might be, compared to the 45 cm of regular sized Rag Pets. Catherine the rag-cat really likes playing party games and dancing. 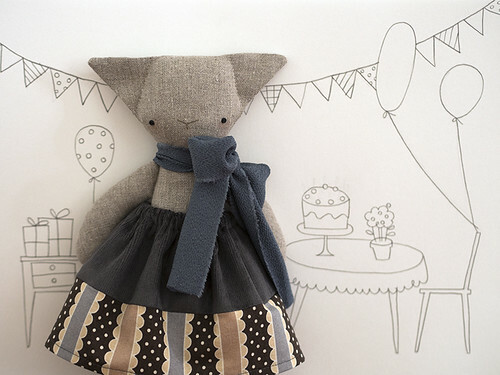 Catherine is wearing a shiny grey corduroy skirt with pretty patterned cotton on the hem and an elasticated waist. She has a silk bow around her neck. Catherine is made out of linen and she has little button eyes and a shiny beige button for a bellybutton. She's stuffed with rags and a bit of polyfill. Bearnard the rag-bear really likes doing party decorations and cake. 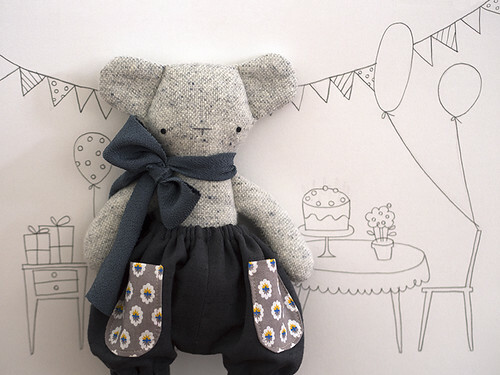 Bearnard is wearing linen trousers with cotton pockets and elasticated waist and cuffs. He has a silk bow around his neck. Bearnard is made out of pretty light blue wool and he has little button eyes and a blue plastic button for a bellybutton. Like Catherine, he's stuffed with rags and a bit of polyfill. I haven't made an update here in much too long! I'll do a proper post or two on my Japan adventures once I've gotten all of my photos and things from there sorted, which may still take a while seeing as I've over 3000 photos all together to get through! 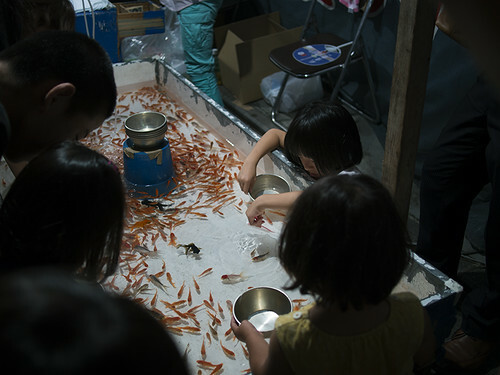 You can see the photos I've already managed to pop online in my Flickr, here: Summer in Japan. But to sum it all up very briefly, I had an absolutely fantastic time there, and I can't wait to tell you all about it! 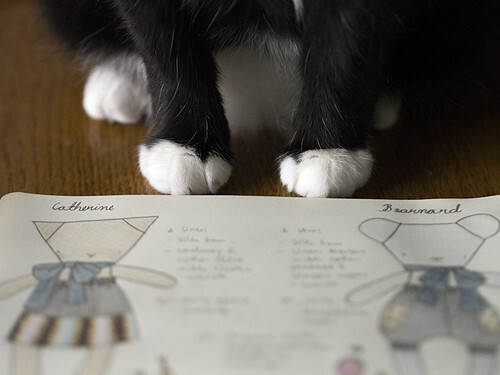 I'm also eager to tell you all about my pieces for this year's Plush You! show, that I'm super excited and glad to be a part of again. 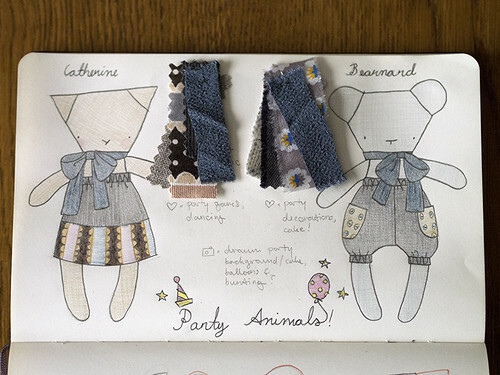 I designed and made a pair of Party Animals, as this is also Schmancy's (the gallery/shop that hosts the exhibition) 10th birthday. I'll be making a proper post about my Plush You!-duo too, they deserve a post of their own instead of a hasty introduction amongst other things. This autumn looks to be a busy one for me, and I hope I can keep up updating things here better than I managed to this summer, as I try to keep up with my life as well!